A wedding will rank as the single-most important day of your entire life so you want to get it right. It's the one day when you're expected to look your very best while staring at the one you love and who you plan to spend the rest of your days with. Talk about pressure! There's no point stressing about the inevitable – just get a little help from experienced professionals. Your tailor is second only in importance to your best man. He will invite you into the showroom, help you relax in an inspiring and comfortable environment, and will understand your needs over a glass of your favourite tipple. Now already a monstrous task has become an enjoyable pastime. The team of tailors and fitters will measure you, guide you through the list of options in terms of cut and fabric, and even advise on how you can stand out from the rest. Often a bride will give an indication of the colour palette she expects form her groom depending on her dress and those of her bridesmaids. Of course, it's all top-secret classified information that can make your job a little difficult, but we’re used to that kind of guesswork. If you have prescribed parameters, your tailor can show you options that fit within them to keep her happy. You’ll see suits in colours that are complementary and receive advice on the finer points, such as accessories like ties and pocket squares. The correct fabric choice defines your made-to-measure suit and will give it the sheen and lustre one would expect from tailor-made. 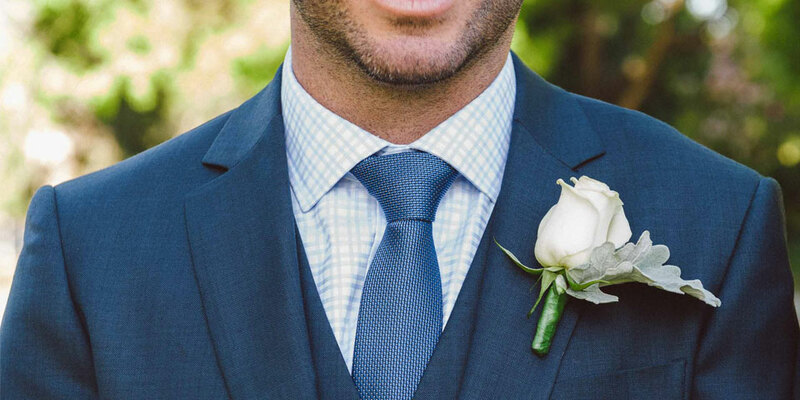 Discuss important points like the time of year on which your wedding falls and the tailor can recommend fabrics that will be appropriate in order to keep you cool and comfortable on the day. Overall a wedding is meant to be a joyous occasion—as should be all of the small details leading up to it. Your suit appointment shouldn't be any different. It’s a bonding exercise with your groomsmen, and will be the beginning of a beautiful relationship with your tailor who will keep you looking good for every other significant event in your future.